Matthew Kraft , Owner, Peter's Clean Sweep and Power-Vac, Inc. has been cleaning residential and commercial air duct systems for 16 years. We also do air duct sanitizing and chimney cleaning along with fireplaces, woodstoves and furnaces. 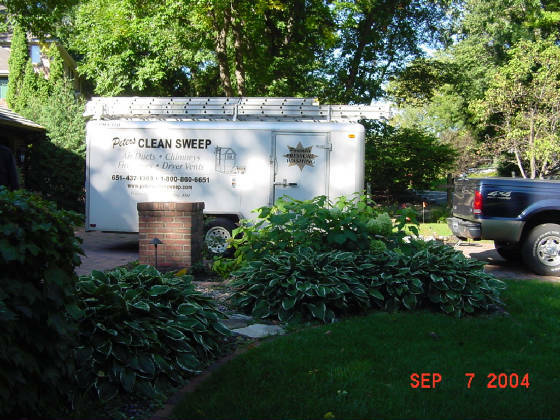 Dryer vent cleaning, gutter cleaning and deck power washing are also available. Along with the cleaning services, repair work is available on chimneys, dampers, etc. We also sell top of the line chimney caps, both standard size caps and special order caps.The equipment used for cleaning air ducts and chimneys is up-to-date and we always use the most current process for cleaning. The vacuum for air duct cleaning will pull up to 5,250 CFM and the air compressor is rated at 175 psi. A number of different attachments i.e., brushes, whip, duct ball, etc., are used during any cleaning process. Time frames for any type of cleaning will vary from job to job. As a “rule of thumb” the average time to go through a complete air duct cleaning will take approximately 3 hours; to clean a chimney from top to bottom can take up to 1 hour.